We present new experimental results on a recently developed set-up, implementing a dynamically configurable network of chaotic oscillators with Chua’s circuits as nodes. The set-up has been designed and tailored to easily perform real time experiments on complex networks with arbitrary topology . We focus here on the emergence of symmetry related synchronization patterns, as well as on the switching among different clusters due to modification of the network structure and/or coupling strength, that are experimentally analyzed for the first time in such type of networks. The observed behavior confirms basic theoretical expectations on small networks, as recently appeared in literature. 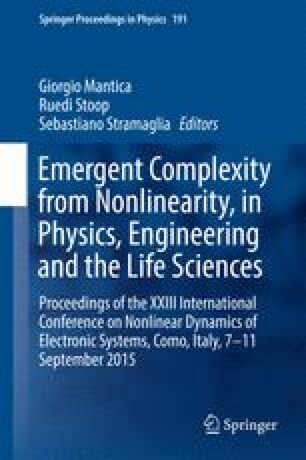 Moreover the scalability to higher complexity network, as allowed by the considered set-up, is briefly discussed.